"There are innumerable Vaikuntha planets, innumerable incarnations, expansions of the Supreme Lord, and innumerable universes also, and of all these existences the Supreme Lord Krishna is the only source. His transcendental body is composed of eternity, bliss and knowledge, and He is known as the son of Maharaja Nanda and the inhabitant of Goloka Vrindavana. He is full with six opulences -- all wealth, strength, fame, beauty, knowledge and renunciation. In Brahma-samhita (5.1) it is confirmed that Krishna is the Supreme Lord, the Lord of all lords, and His transcendental body is sac-cid-ananda. No one is the source of Krishna, but Krishna is the source of everyone. 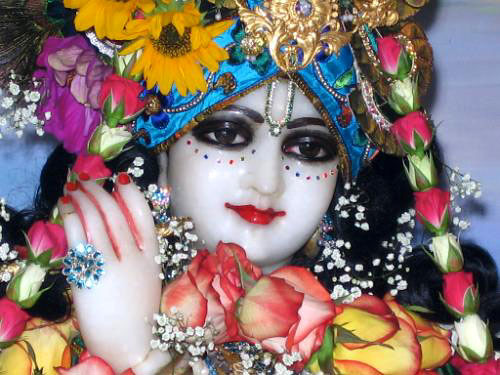 He is the supreme cause of all causes and the resident of Vrindavana. He is also very attractive, just like Cupid. One can worship Him by kama-gayatri mantra."